Register your .me domain name today! You are one step away from owning the domain name of your dreams. Personalise your blog, business or website. The possibilities are endless. Get creative! With .Me, the possibilities are endless – as are the examples of start ups and individuals that make us proud. Looking for an easy, effective way to integrate your online presence? There’s About.Me! Want some rewards while gaming? Check out Kiip.Me! Have a question? Post it on Spring.Me! Register YOUR .Me and join the family! 1. Stand out from the crowd – a .Me is personal, unique and impossible to forget! 2. Avoid excessively long domain names – .Me is short, sweet & available! 3. Personalize your business or start-up, and make it stand out from the crowd. 4. Get the same Search Engine Optimisation (SEO) benefits as with a traditional domain extension! 5. Benefit from the incredible support and promotion courtesy of .Me: have your work featured on our blog and our social media channels! Want your own piece of Internet real estate? Need an online home for that brilliant blog or budding business idea? 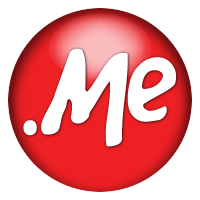 Look no further than .Me — the most personal domain name available! How to start your .me website? Find the perfect .me domain name using our search tool. Register it in minutes! Publish your content and let our team help configure any needed settings to help you go live with your .me website and email.